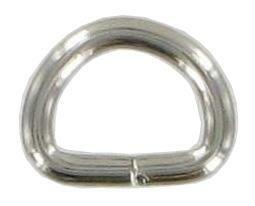 Pack of 10 semi-circular shaped handbag strap attachment in chrome finish. This is ideal for connecting a handbag back to its fine strap and is widely used for this purpose. The dee has a split and if prised open (I use long nosed pliers) it can be attached to either strap or chape (the loop of leather attached to the bag) and closed up again.